You have to know that if there’s some aspect of your life that isn’t making you happy, you can be a person of action. If you asked me four years ago, long before bicycles were a part of the picture, what I’d be doing in 2016, I probably would have told you something about chemistry — running a lab or going back to school for my masters or… something. In 2012 that was my plan and I loved what I did. I loved chemistry. Chemistry and I go way back, to the OG, back before I ever knew anything about chemistry. That’s right. There’s the confession, soaked in the stigma that surrounds “depression” and so insanely difficult for me to sit here and type because of that. I’m not a crazy person. But… my whole life, I’ve been at war with my own mind. Perhaps that’s why the transition from wandering-lost to ‘athlete’ came so easily to me; it’s very easy for me to become completely immersed in endeavors that quiet my brain. Almost to my own detriment, as these escapes tend to become all-consuming addictions. Activating those dormant pleasure centers of the brain is something the depressed seek out with desperation unexplainable to people whose pleasure centers ignite on their own, naturally. And that’s what leads so many people with my problem to more sinister things, I guess, myself included for some time. Anesthetize, repeat. It’s a vicious cycle and it’s hard AF to break. Cycling became the medicine and it was, and is, the most incredible medicine I’ve ever tried. Like night and day, with no side effects but ripped legs and a farmer’s tan. Can’t complain, I’ve always thought a farmer’s tan was smokin’ hot. However, the winter poses a severe problem for me. Because when it gets cold and the days get short, the problem with my chemistry gets compounded to critical mass. The darker and colder it gets, the more my motivation wanes, the less I want to do. The less I do, the worse it gets, and so on and so forth. Last year, I had a surgery in January that sidelined me for nearly 6 weeks, and I can say that it was one of the worst periods I’ve ever had the privilege of living through. Rampant, ceaseless sadness, for no apparent reason. The feeling that you should be able to will yourself out of it, but somehow you just can’t. And on top of it – no exercise allowed, none whatsoever. I was a straight up lunatic for the entire winter, a nightmare to deal with for those lucky enough (that’s sarcastic) to see behind the curtain. And the second I was cleared for mobility again, I hit the indoor trainer with a ferocity that I don’t even know how to describe in words. I was ravenous. Because I was finally quieting my mind. It worked. Despite the set-back of not being able to train for the majority of the winter, I had a baller season last year, wrecking my first race of the year with a 9 minute gap on 2nd place, and then ending the season with another 1st place victory at Belleayre and a 2nd in the pro overall of the Mid-Atlantic Super Series. But the whole time, while all of those wonderful things were happening, I dreaded what was to come. I had severe anxiety about having to live through another winter, having to go through that emotional rollercoaster again, wondering if I could make it another round with that kind of mental turmoil. So I built a cloud and flew away on it. LOL. No, I’m actually serious. I built an online interface (a ‘cloud’) that would allow me to do my job from anywhere. It took freakin’ forever – countless hours of sitting at a computer, tweaking and perfecting, and then filling in all that data… ALL. THAT. DATA. It was a huge undertaking, but when I was done, I was free. One step closer to a warmer winter, an endless summer.. It so happens that my mother retired to Florida a few years ago. Now, when I say she lives in Florida…..
She doesn’t live in like, Fort Lauderdale, LOL. Nahhh. She lives in the sticks, so far out of the way that the only internet connection available is via satellite, which she refuses to get ‘cause why join this century? That’s monetary recklessness! Instead she checks her email once a week at the library, 13 miles away in the nearest “town.” So I bought a mifi and prayed to Sweet Baby Jesus that my cell service would be strong enough to support it. But ya know what? IDGAF about the internet. If I had to bike to that library with my laptop every day to work, I would have. My mind told me that Florida was sunny and it was warm and I could ride my bike every day, I just had to get there. It was a long December of waiting and preparing. The weather went from consistently decent in NJ to pretty bad, pretty quick. The days were getting shorter, I felt my mind tense up with anxiety. Any day now I’d be spiraling into that bad place again… I counted the days until I could go and kept my fingers crossed that my departure date would precede mental insanity. And then on New Year’s Eve, without any drama or nonsense, without any spiraling, I packed my car up, watched the ball drop, and went to bed. On New Year’s Day, I woke up at 6am and drove away from NJ. It was the best decision I’ve ever made for myself. It was a renewing and amazing experience. I never felt the way that I felt last winter in NJ, I never felt that desperation. I mean, I was homesick at times, I missed my friends, but it was a happy sadness… sadness that comes from loving things so much that you miss them, bitter sweet because the pangs of separation are there, but you know you’ll see them again, and you know the happiness that moment will bring you. And the bikes…. Florida mtbing is DOPE. Diiiizzzooooppppeee. I found perfect XC singletrack only 20mi from my mother’s isolated location, and had an awesome tour guide to show me the trails in Ocala, which are some of the illest I’ve ever ridden. 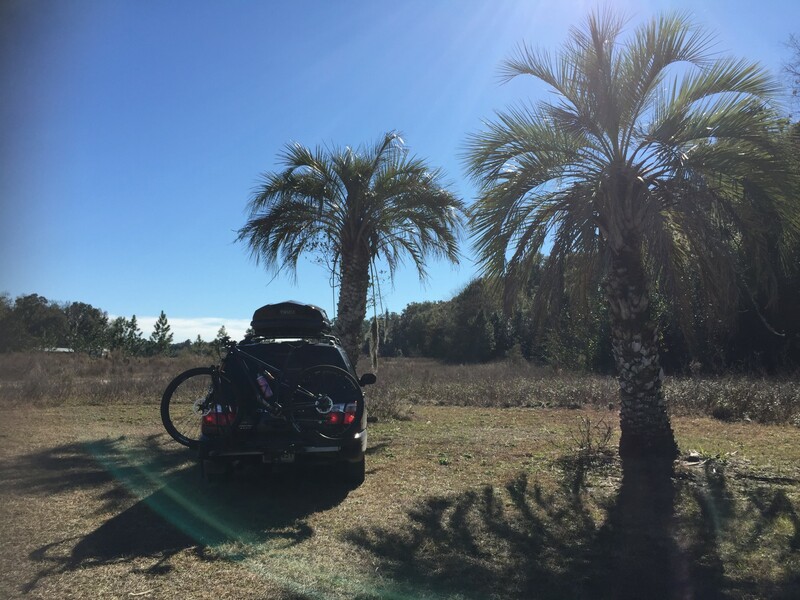 I also got to meet up with one of my NJ riding buddies to hit trails at Alafia State Park for a couple days, and then in February I met up with two of my favorite NJ peeps and my BA-FL connect to race a 12h relay at the Santos trails, which turned out to be one of the most fun bike experiences I’ve had to date — complete with a fire jump (check the instagram! ), camping, and post-race Coronas. Fresh Florida Livin’. It does not get better. I’m not sure what the take away from this should be. I didn’t really want to write this because I’m back in NJ and I’m still not quite out of the woods yet. The weather is on and off and my motivation and mood seem to go with it. Even today, as I’m editing this, it was 35 degrees, windy AF, and it snowed over night. I mean, it’s April now, lol, dafuq. I had to force myself to get on the trainer and yes, afterwards I felt better but I’m tired and frustrated by the constant struggle. I’m worn out, I miss FL. It’s not a pleasant subject… and yet, if we don’t talk about it, we don’t help each other, we don’t give each other ideas on how to get through it, we think we’re alone when we aren’t. So I guess the take away must be this: It’s easy fall into negative cycles and let problems consume us… but don’t do that, LOL. That’s the advice I’d give myself – don’t do that. Haha! SO. SIMPLE. I mean, I do that… all of the time (today even), but it’s important to keep it in your mind that there are solutions, there is always a way through a negative scenario. You have to know that if there’s some aspect of your life that isn’t making you happy, you can be a person of action. You have power over your problems. You are capable of finding a way to change the parts of your life that don’t work for you. The strength you need to do it is inside of you, and the result of your actions will be so incredibly worth it. Just get on the GD trainer for 40min, ok? Ride yo damn bike. You be aight. The other take away is that more people than you realize have the exact same problems as you, whatever they may be. Being open about your weaknesses, admitting them, is the first step to overcoming them. You can’t fix something if you refuse to admit that it’s broken. It’s better to be open, to share your experience, even when it’s difficult, because we all learn from each other. The person next to you might have the solution you were looking for but you’d never know if you didn’t start that conversation. Pretty much every person I’ve opened up to about seasonal depression (and all-the-time depression, for that matter, lol) has said that they’ve felt the same way at some point and are relieved to know that I’ve felt that way too. An open dialogue is how problems get solved, doors are opened, and progress is made. Laura Slavin grew up in the woods. Without many close neighbors or other children to play with, Laura spent much of her time exploring the 2,000+ Norvin Green acres that surrounded her childhood home. The close relationship she formed with nature in her early years helped foster a deep and lasting love of being outdoors that would fuel personal endeavors throughout her life – certainly playing a role in her rapid attachment to mountain biking. DON’T GIVE UP THE SHIP. Great write up and great to hear about your endless summer.